I'm approaching my 1st anniversary; I made my first Playmobil purchase on May 6, 2015. To celebrate, I've been buying Playmobil like mad for the past couple of months; here is MOST of what I purchased in the past 3-4 weeks, lumped together on one table in no particular plan. There are a few things not here, including 5 sets that I got right after taking the pictures, one of which is still in the box. You have been busy! You're keeping fairly within a theme there so it all sort of fits together pretty well. Great additions and very nice pictures!! I didn't get pictures of my new additions from last summer until today. I think I have to do the same as you did here! I'm going to post my entire collection on my "anniversary," May 6. I ordered 4672 today from a toy store in Atlanta, GA. I'm hoping this store will turn out to be a good source for Playmobil. We'll see how this first order goes. Oh well - no luck with the last order. of the Archer. They refunded my payment due to being no longer available. That's a pity, as there were many older items at their online shop that I've wanted for awhile & I suspect they're probably not in supply. I was given a chance to get to Classic Plastics Toy Store last week; this is the store in Parkersburg, WV, where I found the old klickies a few weeks ago. I found two treats: The first was a baggie with a knight klickie & a horse. going for $0.49. The klicky is the Blue Knight, 4616. The horse I can't identify. All I can comment on is that the saddle is not a separate piece. Through DS I've found all the other pieces for the Blue Knight set except the shield & the helm plume. Can you help in my quest? The other item was an unopened Happy Meal from 1982, the sheriff with rifle & rocking chair. It was $4.99; I don't think I'm going to open it but instead keep it as is. I was very excited to get it. THe store has been advised to keep me abreast of any new Playmobil that comes in. The horse I can't identify. All I can comment on is that the saddle is not a separate piece. Nice color on the horse. Yes, I have both those spare. But someone nearer you may have them and help save on shipping costs (I am in UK). Oh, I see. Nice find! 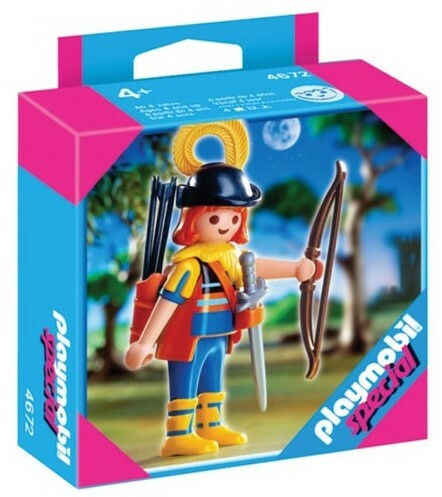 The toy which set back the acceptance of Playmobil in the US by 20 years. (that's probably a bit harsh, tbh).